Donald Trump is setting a time bomb for racial violence on Election Day. His calls for racial voter intimidation on Election Day could explode in all our faces. Donald Trump speaks to a crowd of supporters on Tuesday in Prescott Valley, Arizona. Trump first told his supporters of this conspiracy theory at an Ohio rally in August and followed up the claim in an interview with Sean Hannity: “I’m telling you, Nov. 8, we’d better be careful because that election is going to be rigged. And I hope the Republicans are watching closely, or it’s going to be taken away from us.” This was in line with comments from his surrogates, like longtime adviser Roger Stone, who told Breitbart that Trump would begin to talk “constantly” about voter fraud. “He needs to say for example, today would be a perfect example: ‘I am leading in Florida. The polls all show it. If I lose Florida, we will know that there’s voter fraud.’ ” Stone continued: “‘If there’s voter fraud, this election will be illegitimate, the election of the winner will be illegitimate, we will have a constitutional crisis, widespread civil disobedience, and the government will no longer be the government.’” The implication is clear: If Trump loses, he should foment this “civil disobedience.” And he should start preparing his supporters for it now. He seems to be doing just that. These are rhetorical time bombs, statements that cast doubt on our democracy, planted with growing frequency as Trump tries to rationalize the fact that he’s losing. There’s a chance this is harmless, that Trump will resign himself to defeat if he loses to Hillary Clinton and bring his supporters with him—during the first presidential debate moderator Lester Holt asked him whether he would “accept the outcome [of the election] as the will of the voters,” and he said unequivocally “the answer is that if she wins I will absolutely support her.” But that was before he lashed out against the media for his poor performance, before the polls began to tilt back in Clinton’s favor. Now that he’s behind, Trump has returned to questioning the legitimacy of the election. 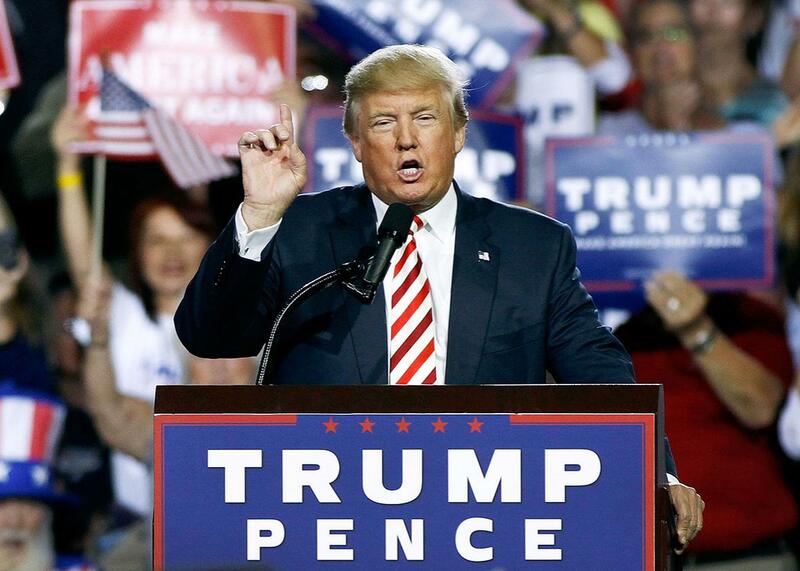 More critically, the idea that he would respect the results of the election, full stop, ignores the hatred that’s come to characterize Trump’s campaign, the violence he’s condoned against protesters and other vocal opponents, the virulent prejudice he’s brought to mainstream politics, and the apocalypticism of his message, where he stands as the final hope for an embattled minority of resentful whites. These rhetorical time bombs, in other words, could be the catalyst for actual intimidation and violence, before and after Election Day. And if that violence and intimidation strikes, it will be against the chief targets of Trump’s campaign: people of color. What does Trump mean by “areas?” It’s simple: He means places where black people live and vote, a dog whistle calibrated to an audience of voters who have lived off of a decade of conspiracymongering, from breathless theorizing over the obscure New Black Panthers to hysteria over groups that register voters and bring them to the polls, such as ACORN. And in particular, Trump is speaking to the idea—propagated through conservative media—that Barack Obama stole the 2008 and 2012 elections by using fraud and other nefarious tactics in cities like Philadelphia. The “evidence” for this is Obama’s high support in a handful of inner-city areas. In 2012, for instance, there were precincts in Philadelphia and Cleveland where Obama won as much as 100 percent of the vote. These predominantly black neighborhoods backed the president with overwhelming support, as they had in the previous race against John McCain. This wasn’t unusual. Given the size of the country, the number of voters, and the extent of residential and political segregation, these unanimous areas—in Philadelphia, 59 divisions of several hundred voters each—were inevitable. Indeed, it happens for Republicans too. In 2008, McCain won 80 percent or more of ballots cast in counties across the interior South, despite losing the general election by 7 percentage points. But this dynamic was more pronounced in hyper-segregated communities of black Americans, an electorate that—according to exit polls—backed Obama with average support of 94 percent in his two elections. Statistically, there was a decent chance that one nearly all-black precinct or another was going to vote unanimously for the president. But to many conservatives, this was suspect. On his syndicated radio show, Hannity said that it was “mathematically impossible” that no one had voted for Mitt Romney in these areas and that therefore, it “means we’ve got cheating going on in our elections.” Hannity’s disbelief echoed across right-wing media, where outlets like Breitbart and Townhall ran with the claim that voter fraud skewed the results in cities like Philadelphia and Cleveland. When considered in the elaborate canon of right-wing media, where marginal groups like the New Black Panthers stood as a threat to the voting rights of white Americans, the message was clear: Black voters had broken the rules and stolen the election from Romney for a black president. This wasn’t just a conspiracy conservatives could believe in; it was one they were primed for. The allegation that Obama “rigged” his election to the White House goes back to the 2008 race, when Republicans went on a crusade against the Association of Community Organizations for Reform Now, or ACORN, an organizing group that worked to register voters and advocate for low-income families. A blitzkrieg of anti-ACORN rhetoric swept conservative media, driven by doctored and misleading videos from far-right provocateurs. In the wake of the frenzy, 52 percent of Republicans believed the ludicrous claim that the group had “stolen the election” for Barack Obama, comparable to the 51 percent of GOP voters who said that Obama was born outside of the United States. Today, Trump’s rhetoric is having a similar effect. According to a recent poll from the Associated Press, 58 percent of his supporters believe there is voter fraud, and half say that they have “little to no confidence in the integrity of the vote count.” Whether he realizes it or not, Trump’s attack on the election process grows out of years of mainstream Republican behavior and rhetoric that revved an engine of paranoia and fear among conservative voters. In addition to its strict requirements for identification, for example, North Carolina’s GOP-backed (and unconstitutional) voting law expanded the reach and authority of poll observers, allowing them to challenge any voter without cause, as long as they themselves were registered residents of the county (instead of the precinct). The provision was a boon to outfits like True the Vote, an anti-voter fraud group that essentially works to intimidate would-be voters. Along with Trump himself, these measures represent and channel the rage of an angry plurality of white voters that sees Obama—and the cosmopolitan America he represents—as an existential threat to their perceived place in national life. This dynamic has a history in America. White backlash to black progress—from Reconstruction to the civil rights movement—is a potent part of our past, and whenever it strikes, black voters and black voting are always the first target. On the eve of the 1868 presidential election, white vigilantes and Klansmen in the South terrorized newly enfranchised freedmen and killed black lawmakers, including state representatives in South Carolina and Arkansas. “In Camilla, Georgia,” writes historian Douglas Egerton in The Wars of Reconstruction: The Brief, Violent History of America’s Most Progressive Era, “Democrats opened fire on a Republican parade, killing or wounding twenty black marchers, and a black Georgia assemblyman was dragged from his home and nearly beaten to death.” In Louisiana, following the 1872 presidential election, “Republicans charged that more than two thousand supporters had been ‘killed, wounded, or otherwise injured’ in the final weeks leading up to [Ulysses S.] Grant’s reelection.” Authorities in one parish of the state stumbled upon the bodies of more than two dozen black Republicans. According to one account, survivors of the massacre were forced by Klansmen to march to the polls and cast a Democratic ballot. Just as common as outright violence was intimidation at the voting booth. During New Jersey’s 1871 state and local elections, for example, mobs of white Democrats arrived at the polls in Camden to intimidate blacks out of casting ballots for Republican candidates. Some of this anger was pure partisanship, an effort to win by any means necessary. But the larger source was rage at the very idea of black voting, part of a broader belief that black Americans were illegitimate citizens: that they were ignorant, dependent, unworthy, and undeserving. And so it continued through American history. In 1900, after taking North Carolina’s government back from a coalition of Populists and black Republicans using violence and intimidation, Democrats established Jim Crow, eliminating black voters from the state’s voter rolls. Sixty years later, racial reactionaries would fight a rear-guard action against the movement for voting rights, using violence, intimidation, and as much legal chicanery as they could muster. This didn’t just happen in the South. If we are living in the midst of another white backlash—and Trump’s ethno-nationalist campaign for the White House suggests that we are—then it’s only fitting that we’ve seen a new push against full access at the ballot box, spearheaded by a political party enthralled to a recalcitrant movement of white revanchists. Likewise, it’s fitting that its symbol and head, Trump, is now channeling a sesqui-century of racial reaction. The difference between now and the past is that these new racial reactionaries are losing. For all their rage and anger, they are far short of a majority. Their primal scream isn’t enough to close the electoral gap. Donald Trump is on track to lose this presidential race, shut down by a strong—if somewhat silent—majority of blacks, Latinos, Asian Americans, and young people, along with liberal and moderate whites. Still, Trump’s anti-democratic conspiracymongering is unprecedented in modern elections. And we can begin to guess at the consequences of this rhetoric. Angry people, stirred by demagoguery and convinced they’ve been robbed of their rightful power, are a real threat to the already-frayed fabric of our democracy. Donald Trump thinks the election is rigged. He says we need to watch “areas.” Despite what he said at the debate, he’s also said that, should he lose, he doesn’t know that he will concede: “We’re going to have to see. We’re going to see what happens. We’re going to have to see.” And if he doesn’t? If he loses and pushes his base to reject the outcome? Then we could see protests, we could see mobs—we could even see violence, all directed against the people supposedly stealing the election. It wouldn’t be the first time.